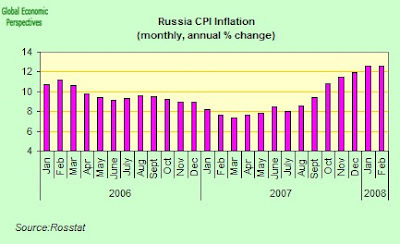 Internal inflation in Russia continues to spiral dangerously upwards, with the cost of goods leaving Russian factories and mines rising at the fastest rate in more than three years in February as global energy and commodity prices remained high, and internal wage pressures continued to push up costs. 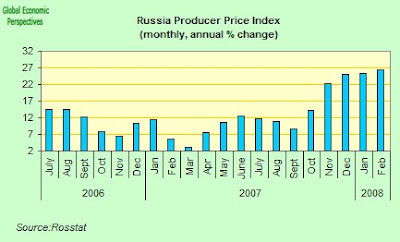 Russian producer prices increased by 26.4 percent year on year in February, the fastest annual rate since December 2004, and up from 25.2 percent in January, according to data from the Federal Statistics Service today. Prices rose by 0.6 over January. 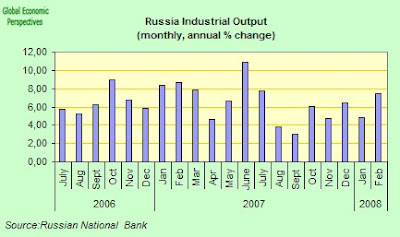 and industrial output expanded 7.5 percent. Meantime Russia has raised its official 2008 inflation forecast to 8.0-9.5 percent, up from the previous 7.5-8.5 percent, according to the Economy Ministry's chief macroeconomic planner, Gennady Kuranov, at a news conference today. Russian monthly inflation decelerated slightly in February with prices rising 1.2% over January, following January's large 2.3% increase over December, according todata out today from the Russian statistics service. 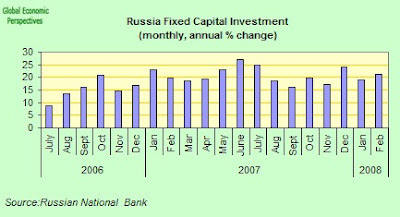 Little of deep significance can be attributed to this though since a large part of the difference was due to the fact that utilities and housing maintenance costs only increased by 1.3 percent in the month, while they had increased by 11.8 percent in January, the month in which the Russian government traditionally introduces the largest increases for water, power and heating prices. The rate of increase was still up over the monthly increase of 1.1% in February 2007, core inflation remained strong, and year on year inflation is estimated to have remained at last months level of 12.6%. Price growth in February was led by food costs, which increased a monthly 1.7 percent. The cost of the staple food basket reached a monthly average of 1,941 rubles ($80.67) in Russia and 2,182 ($90.69) in Moscow. Core consumer-price growth, which excludes seasonal and other factors that affect inflation in the ``short-term,'' was 1 percent in February, the statistics office said.